The film is dedicated to the 25th Anniversary of the Independence of Algeria and is about the present Republic Day. 1 hour - 25 years of state independence of Algeria (holiday and newsreels). 2h. - Industry and Agriculture of Algeria. Soviet-Algerian cooperation. 3 pm - Algeria today. Street of the city - LS., PNRM. Celebration in honor of the 25th anniversary of the state independence of the Algerian People's Democratic Republic, ritual dances at the stadium - different., Spectators in the stands, waving flags (including foreign visitors) - Various. Pass the participants of the event - different. The musicians play drums - CU., PNRM. The members of the Government on the podium - LS. Algerians say about the holiday (synchronously, inaudible) - CU. Children on the platform - MS., PNRM. The audience applauded - LS., PNRM. Monument in honor of those killed in the anti-colonial war: a monument with a statue of a soldier in Algeria ("Maqam al-Shahid») - MS., PNRM., LS. ; Another monument - LS., PNRM., MS.
Road, away mountains OPEC, PNRM. 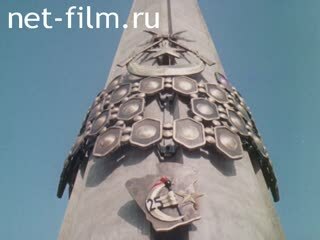 the obelisk at the place where an armed revolt against the colonizers - MS., PNRM. The soldiers are with guns in the valley, climb the rock, run, shoot. Navy ships in the sea, helicopters lifted from the aircraft carrier, the aircraft dropped bombs, explosion. Algerians at the meetings are held, are recorded in the national liberation army. A soldier wears his cap, stand and go armed fighters of the national liberation army. Verification of documents from the French Algerian population. A fire in the village. Soldiers walk past the house on fire. Speaks French President Charles de Gaulle. People in the area, on the streets. Bypass the officers, congratulated the soldiers. A nurse with a boy. Policemen run, throw grenades, shoot. Bus runs into a tree. Evian (French-Swiss border): the car pulls up to the building, shoot photographers. Signing the agreement on self-determination in Algeria: men talking, enter the building. Popular referendums in France and Algeria: people vote at the polls. General view of the city. The declaration of independence of Algeria: the rise of the flag. Shepherd and herd of cows. Soviet ship with grain at the port. A meeting of the Algerian and Soviet representatives. Passing on the street cars, waving flags, signing documents, exchange of documents. El Hadzharsky Steel (appearance) - LS., MS., PNRM. Go and stand Algerian workers - MS., PNRM. Drove by a special machine - MS.
On the territory of El Hadzharskogo plant are complex domain master Ivan Korobov (USSR) and the shift Mize Larbi (Algeria), talk about the work at the plant (synchronously in Russian) - MS., CU., PNRM. Drove by a special machine - MS., PNRM. Torch over the pipe - MS.
Construction of a thermal power plant near the town of Jijel - LS., MS., PNRM. Excavator pours sand into the car - MS.
Chief engineer of the General Directorate of building A. Kristenko (synchronous) - CU. South to the Sahara desert, people go to the hospital - MS., PNRM. Soviet doctors examine patients - MS.
VF Kovov talks about the Soviet doctors in hospital in Ghardaia (synchronous) - CU., MS.
Gardena - LS., PNRM. ; Street - MS., PNRM. Trading numbers in the old part of the city, local residents. Camels in the desert - LS., PNRM. Desert - LS., MS., PNRM. The road in the desert - MS. Oil-producing areas in the Sahara - LS. Refinery - LS., MS. (With motion). Workers at an oil well - MS., Departure. Tanks, oil pipes - MS., PNRM. Go to work - MS. The water in the canal water flows - MS., LS., PNRM. Date palms - MS., CU., PNRM. Plantation Development Institute vegetables - LS., CU., PNRM. An employee with the device - MS. Experimental animal farm: cows in a pen - LS., MS. Picking tomatoes - LS., MS. (With motion). Says an agricultural worker (simultaneously in Arabic) - CU. Algerian landscape with mountains - LS., PNRM. Mechanics and agricultural equipment - MS., PNRM. Tractor plant in the city of Constantine, are ready tractors - LS., PNRM. Pass the factory workers - MS., LS., PNRM. About plant says Chief Engineer Mulyud Hebab (synchronous) - MS.
Tractor plowing the land - MS., PNRM. Plowed land - LS., PNRM. Shepherd with a flock of sheep in the pasture - LS., MS., PNRM., CU. 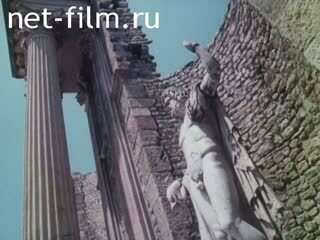 The ruins of ancient cities, ancient columns - MS., PNRM. Statues - MS., CU., PNRM. Stone Roman theater - LS., PNRM. The streets of the city of Constantine - MS., LS., PNRM. Monuments of the Roman Emperor Constantine - MS., Hitting. Bridge across the gorge - LS., PNRM. Other Gorge - LS., PNRM. People walk across the bridge - LS., PNRM. Traffic controller in the street - CU. People walk, sit in a cafe on the street - MS., LS. Building Konstantinskogo University - MS., PNRM. University biology student Samir Ben Hammad passes on the street, said about the university (simultaneously in Arabic) - MS., CU. People at the pay phone - MS., PNRM. Students in the lobby of the university's stand - MS., PNRM. City - MS. (With motion), LS., PNRM. The unloading dock workers - MS. Streets Casbah - the old part of the city - MS., PNRM. (With motion). Old men talking - MS., CU., PNRM. Monument Emir Abdel Kader - MS., CU., PNRM. Children on the street - MS.
People at the window - MS. The Kremlin, Moscow - MS., Departure. General Secretary of the CPSU Central Committee Mikhail Gorbachev, General Secretary of the party "National Liberation Front" Sh Bendjedid. Continuation of the holiday at the stadium in Algiers: are participants of parade, dancing youth - different. Man playing on a pipe - MS., PNRM.